1st time on market...one family home!!! This home has SO much to offer, great floor plan and many major updates already done. New furnace and CA 10/12, new roof 8/12, replacement windows, gutter helmets, new carpet in family room 1/13, hardwood in bedrooms. Seller is willing to pay $2000 toward closing cost or decorating allowance with full priced offer. Easy to show...won't last!! 4709 Laramie Ct, Louisville KY 40216 is a Home, with 3 bedrooms which is recently sold, it has 1,673 sqft, < 1/2 ACRE sized lot, and 2 1/2 Car Garage parking. A comparable Home, has 3 bedrooms and 1.5 baths, it was built in and is located at 1424 Cloverhills Dr Louisville KY 40216 and for sale by its owner at $ 169,900. 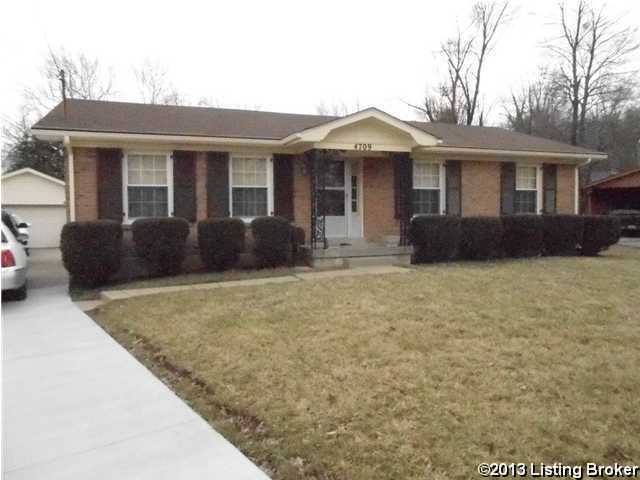 This home is located in the city of Louisville , in zip code 40216, this Jefferson County Home, it is in the CLOVERLEAF Subdivision, and CLOVERLEAF are nearby neighborhoods.